Today we have released Gallio v3.0 Alpha 2, including a preview of MbUnit v3. Go visit our new website for the download: www.gallio.org. There's been a ton of work behind the scenes to provide a compelling model for data-driven testing. Here's an example of this feature in action. Notice the use of generic method parameters. Also notice that we perform an automatic string to DateTime conversion and that we take some care in how we format the parameters for presentation in the test results. 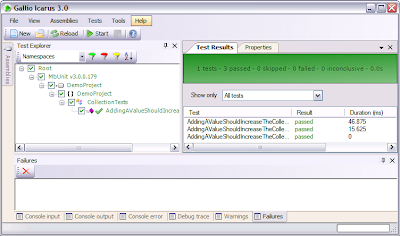 Run tests inside ReSharper. The Gallio plugin for ReSharper currently supports MbUnit v2, v3, and xUnit.Net. It will of course support any test framework with a suitable Gallio adapter. For example we have a prototype of a native NBehave implementation on Gallio with full ReSharper integration that just works. 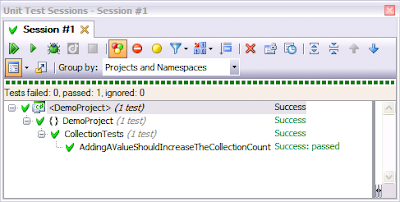 An MbUnit unit test session in ReSharper! Development on the GUI is progressing smoothly. It is not quite feature complete but it is coming along quite nicely. The trick is that the tests will run in an isolated host process with the profiler attached. You can of course plug in your own runners too. You can of course pass the same arguments to the NAnt task, PowerShell task and the command-line runner (Echo). We've made it easier to get new projects off the ground by providing Visual Studio project and items templates. 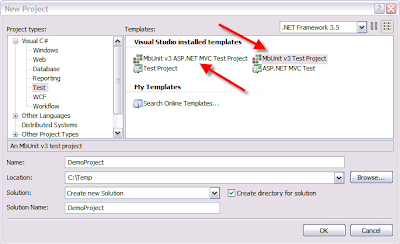 What's more, we also support integration with the new ASP.NET MVC unit test project Wizard! Mark did some great work on www.gallio.org. Please tell us what you think. We'll be busy over the next few weeks filling it up with content, including documentation. Really. Lots. We've got a book project underway and tons of little details just below the surface like automatic data conversion, rich formatting, MHTML reports, isolated test host processes, embedded images in CCNet reports, new API, a Pex package and more. Expect more blog articles coming your way. Caveat: This release is an Alpha. It is a high-quality Alpha, but an Alpha nonetheless. It is not feature complete but it is quite featureful! I am indeed using it in production. But your mileage may vary so please send us your feedback! 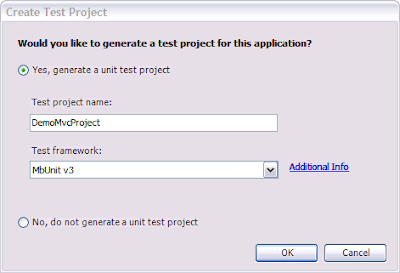 Can you give an example of doing the abstract test pattern in mbunit3 using testdriven.net plugin? Would you mind explaining the NCover integration a bit more? I don't know if you use ReSharper, but I'm curious if this is a backdoor way to get NCover to work with it. I'm using TypeMock 5.1 for my project. Works fine in VS, but when I'm running the Gallio task with RunnerType="TypeMock" the ReturnRecursiveFakes doesn't seem to work. This is most likely because this is a new feature. How do I make Gallio run under the current 5.1 version of TypeMock? (tried to upgrade the TypeMock.Integration.dll in the Gallio distribution).